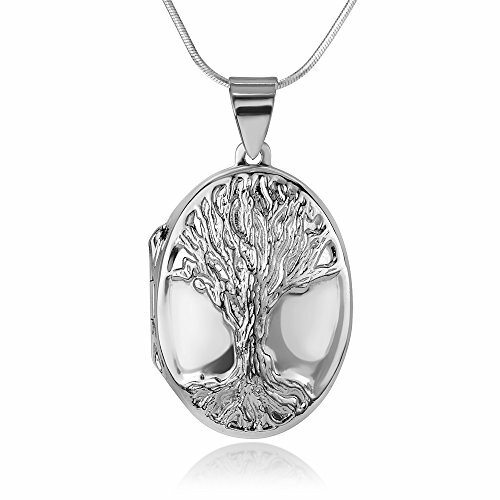 This beautiful Tree of Life Locket necklace would be a wonderful addition to any wardrobe. The included black velvet pouch makes it a perfect gift for any special occasion. Made from nickel free 925 sterling silver with stamp 925, high polished finish. The pendant comes with the Italian 925 sterling silver snake chain 18'', Spring ring clasp. Perfect and meaningful gift for keeping photograher, or memorable little things inside. While Chuvora products are designed to last, proper care is an important part of keeping your jewelry looking it's best. Be sure not to wear your jewelry while cleaning or working with harsh chemicals, in pools or spas, or while playing sports. Store your jewelry individually to keep them from scratching each other. Store sterling silver jewelry with anti-tarnish strips to keep them looking their best. To clean your jewelry, use a warm, soapy water soak and a soft brush - especially when cleaning jewelry that contains gemstones. STAMPED 925 STERLING SILVER - This high quality of tree of life locket pendant and chain is made from the finest sterling silver as indicated with 925 metal stamp. 925 sterling silver is made from 92.5% silver and 7.5% copper. The copper is added to stabilize the silver so that it can hold its beautiful shape. NICKEL AND LEAD FREE - These beautiful pendant and necklace contain absolutely no nickel or lead, making them safe for people with nickel and lead allergies. Add this great of pendant and necklace to your jewelry collection and have peace of mind every time you wear them. PENDANT NECKLACE - This tree of life pendant size 0.86 x 1.45 inches long (height including the bail) Inside Measurement 0.59 x 0.9, The pendant comes with the sterling silver snake chain 18 inches long, Spring ring clasp, making them a subtle addition to any outfit. You can wear this of endearing necklace with a pair of jeans or wear them with a fancy dress to add a girlish or female. TREE OF LIFE LOCKET DESIGN - The meaning tree of life as a spiritual symbol is well known and, like the tree itself, with its branches reaching into the sky, and roots deep in the earth, it dwells in three worlds- a link between heaven, the earth, and the underworld, uniting above and below. It is both a feminine symbol, bearing sustenance, and a masculine, visibly phallic symbol - another union. This tree of life locket is openable and can put a photo or note memories into it. GREAT AS A GIFT - This beautiful of tree of life locket pendant necklace in a pretty Black Velvet Pouch would be a perfect gift for that special someone in your life. Buy these pendant necklace for your wife, daughter, sister, or best friend, and know that without a doubt you have purchased the perfect present for the any occasion, whether it is for mother's day, valentines-day, Christmas, graduation or their birthday. If you have any questions about this product by Chuvora, contact us by completing and submitting the form below. If you are looking for a specif part number, please include it with your message.